What does Pokemon: The First Movie: Mewtwo Strikes Back have to say about Adolf Hitler? This is a question your resident Movie Boys have the answer to! Pokemon tears can heal the dead, Minnesota is the link between realities, and Team Rocket just can't deliver the goods. This movie is out of its damn mind. Thorstein Veblen: Norwegian-American sociologist/economist who lived on a farmstead in Minnesota. It's now a national historical landmark. Ever hear the term "copious consumption?" Veblen coined that one! SKYRIM BELONGS TO THE NORDS! . . . Sorry, couldn't help myself. TBF, MN's history is full of stories of immigrants coming from Norway, Sweden, and other Nordic countries. So it's kind of true. Plus there's the football team but I don't care about football. Just wanna take this moment to reiterate how much I want Mewtwo Gear Solid 4: Pokeballs of the Patriots to be a real thing. Conrad is so smug. "This is clearly for babbies you idiots!" "Im too intellectual for this child play!!!" @jade-rodriguez-371008657: Yeah, I can't stand that either. Of course, some anime (like Pokémon and Dragonball Z) are specifically written for children to consume, with all of the intellectual rigor that allows for. Which is not to say they cannot be entertaining to adults in myriad ways; they can and are, even when they're facile, condescending and overly simplistic by necessity. Doesnt it reference the american football team?? While you are equating a a rugby or boxing match with a warzone, any hint of context is wiped out of English localisation. @darkalter2000: Only in the sense that the word was coined, rather than being nonsensical. Watchmen confirmed for ripping off Pokemon: The First Movie. Huh. That's legitimately a big missed opportunity to make Mewtwo a psychologically layered Magneto-ish villain that the other characters could have called him out for being and inspired some genuine pathos. Like, that would have been the most poignant thing in the movie by FAR if they'd thought to include it. I don't know how I never thought of this before. Alright, here I'm gonna be that guy that considers the merits of Pokemon: The First Movie way more than anyone does or perhaps should. The message of the movie is way too simplistic and heavy-handed to resonate with anyone older than, say, ten, but it's not hypocritical. When Nurse Joy adds "Not like this" or Brock says "it's not right to make Pokemon fight *this way,*" that's the movie differentiating between normal, fun Pokemon battles versus the nasty fight to the death that all the ones in the scene are having. 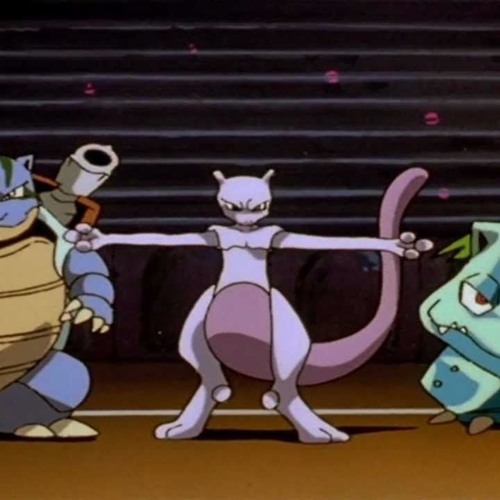 That's why the early scene with Ash battling the random trainer over the credits is there (in addition to providing the movie with a lively opening): To demonstrate what Pokemon battles should be, that fighting is okay as long as it's not done out of malice and no one truly gets hurt, etc. Again, that's not to say that the message is conveyed well or even that the film makes what I just pointed out as explicit as it should have, but the anti-violence message is pretty sound.